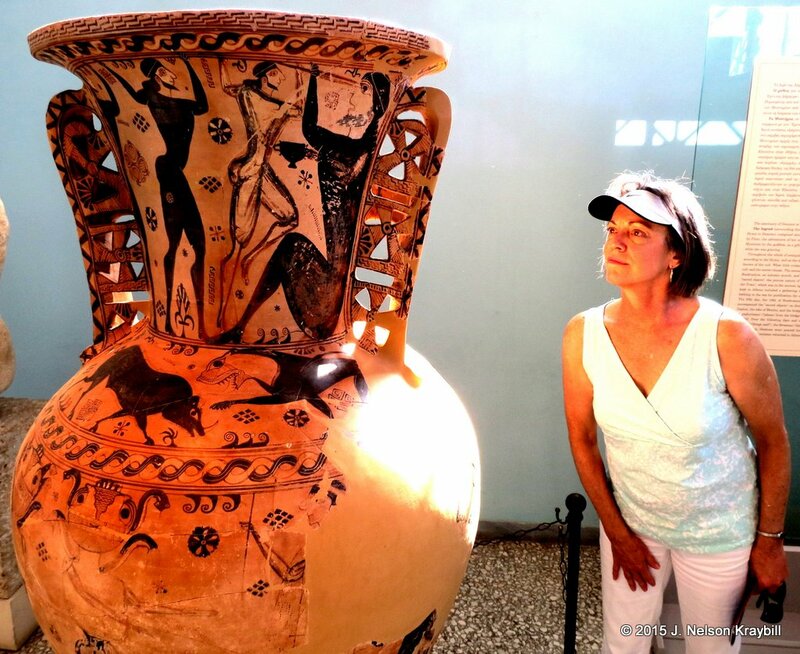 Ellen Kraybill examines a large vase from about 650 BC that depicts Odysseus blinding the Cyclops. Archeological Museum of Eleusis, Greece. 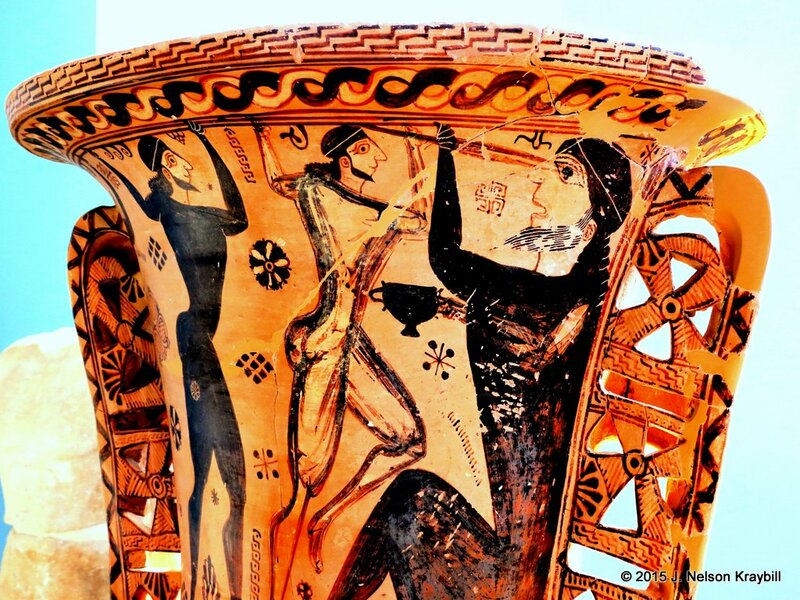 Look closely at the grisly scene on the great amphora vase in this photo. The center figure—Odysseus, hero of Homer’s epic poem—thrusts a pointed and heated pole into the eye of a Cyclops named Polyphemus. The eyeball “hissed around the spike,” Homer says. The one-eyed giant—now blinded—had trapped Odysseus and companions in his cave. The monster already had devoured several of them, “gaping and crunching like a mountain lion.” So the captives got their tormenter drunk, gouged his eye, and contrived escape. Recently I thrilled to stories of The Odyssey as my wife Ellen and I visited biblical sites across Greece. Homer’s 700 BC poem is magnificent, with derring-do on the high seas, scenes of lavish hospitality, and wit on every page. But brutality frames and pervades the epic. Odysseus is on a ten-year voyage back from ferocious war against Troy (a battle described in The Iliad). When Odysseus finally makes it home to Ithaca, he splatters the brains and guts of every single suitor who tried to woo his wife Penelope while he was gone. Thus ends the saga. Biblical Philistines—especially the giant Goliath—come to mind when I read The Odyssey. Though Homer probably drafted his epic poem about 700 BC, his tales about Troy and Odysseus likely go back in oral tradition to about 1200 BC—exactly when Israelites were entering Canaan several hundred miles to the east. The political chaos in Greece and Turkey that Homer describes in The Iliad and The Odyssey could be the same upheaval that pushed Philistines and other “Sea Peoples” of the Aegean region toward Canaan. Philistines settled in Canaan just as Israelites entered from Egypt—and the two peoples came into conflict (see more on Philistines at https://peace-pilgrim.com/2014/07/07/gaza-goliath-and-overcoming-hatred/). Ever notice how nations and peoples in conflict are tempted to make their foes either subhuman or superhuman? The Cyclopes, as Homer portrays them, are a boorish tribe of one-eyed, anti-social, lumbering cannibals—both subhuman and superhuman. When Israelites, after wandering in the wilderness, sent scouts into Canaan, the spies reported that the land was inhabited by giants who made the Israelites feel “like grasshoppers” (Num. 13:33). Philistines—who in many ways had more advanced culture than the Israelites—got personified in Israelite memory with the nine-foot giant, Goliath. His spear shaft was “like a weaver’s beam,” and he promised to feed shepherd boy David to the birds (1 Sam. 17). More recent conflicts have generated talk of giants. American propaganda during World War II, for example, sometimes portrayed Germans and Japanese—now our friends—as subhuman monsters. Popular media today sometimes portrays Islam, with its magnificent heritage of culture and faith, as pure menace and terror. The reality is that all peoples and nations bring a mixture of noble generosity and selfish violence. Within the Old Testament there is hope that “all families of the earth” someday will be blessed by the faithfulness of Abraham, Sara and their descendants (Gen. 12:3). Hebrew prophets foresaw a time when nations will cease learning war (Isa. 2:4). It is right for Christians to read blood-and-guts portions in the Bible, because these still are realities of human experience that we cannot ignore. But we also can rejoice that the trajectory of history ends with a Lamb who brings a “healing of the nations” (Rev. 22:2). If you benefit from this website, please recommend it to your pastor and friends. Thank you! This entry was posted in Uncategorized and tagged Elefsina, Eleusis, Goliath, Homer, Odysseus, Odyssey, Philistines, violence in the Bible by nelsonkraybill. Bookmark the permalink.